This is a wonderful 6 inch high by 10 inches wide soft-bound 47 page booklet, highlighting the "Championships, Records and Successes throughout the World" for 1963, "... another triumphant year for the masterpiece in oils", published by Castrol Limited, Castrol House, Marylebone Road, London N.W.1. Illustrated with many black and white photographs (only a few are of Lotus Cortinas. 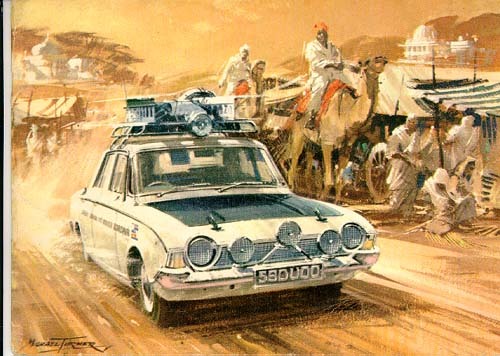 Remember that the Lotus Cortina was only introduced in the Spring of 1963...) and several color reproductions of Michael Turner paintings, including the cover art of a Ford Corsair.